I'm new to the forum but I wanted to get some feedback on others in the know about speaker placement. I'm finishing my basement now (framed but no drywall) and I want to run speaker wire. 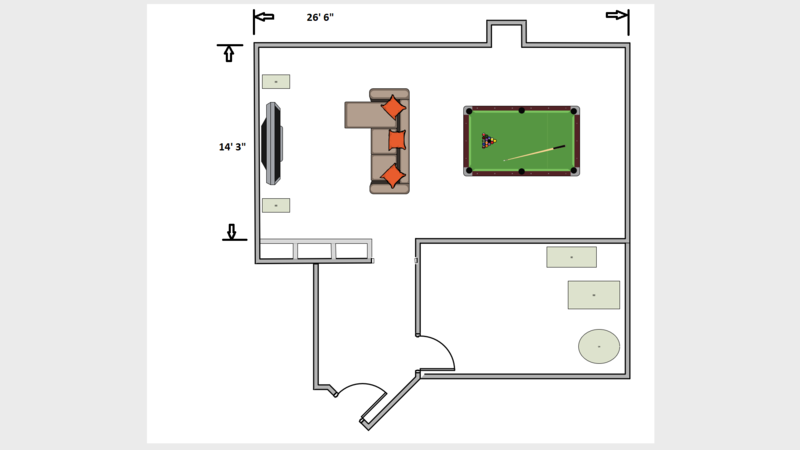 I currently have Polk speakers in the front (RTi A9) and I want to finish the basement with a 7.1 surround. I bought 2 pairs of RC60i's that I was going to install in the ceiling but then I saw (and heard) the FXiA4 and I was wondering if I should include those in place of one pair of RC60i speakers. Any help would be greatly appreciated! Thanks everyone! In ceiling would most likely be the best for that room configuration. If the TV and pool table configuration could be swapped, a pair of wall mounted speakers would work as side surrounds. will need to be braced or the tile might sag. Maybe install one pair in the wall right around where the corner pockets are (rack end), above the seated listening position. If you have the room in the ceiling look at the 70-RT it is a match to the RTiA line and it is a killer in ceiling speaker. I was thinking about placing the FXiA4 speakers on the wall behind the couch. From what I've seen, these speakers work well behind the listener. I will install a pair of VS70RT speakers in the ceiling between the listener and the TV. FX speakers on the side wall right behind the couch. Get a pair of RTi-A4 and mount them on the wall behind the pool table. In ceiling speakers between the FX and Rti-A and in between the fronts and listening position. Add an HSU or SVS sub then enjoy. Ceiling is the best to go for I think given the shape of the room.